A couple weeks ago I took the kids to the Great Wolf Lodge indoor water park in Williamsburg, VA. It was just an overnight trip that was a combination of a good-report-card treat, early Valentine's gift, and Mommy-got-a-good-deal-on-a-Groupon!. The kids and I (plus their grandma) really enjoyed our little mini-vacation. Since there are several Great Wolf Lodges around the U.S. and Canada, I thought I'd share our experiences and pass along a few tips in case you're thinking of planning a trip to one. 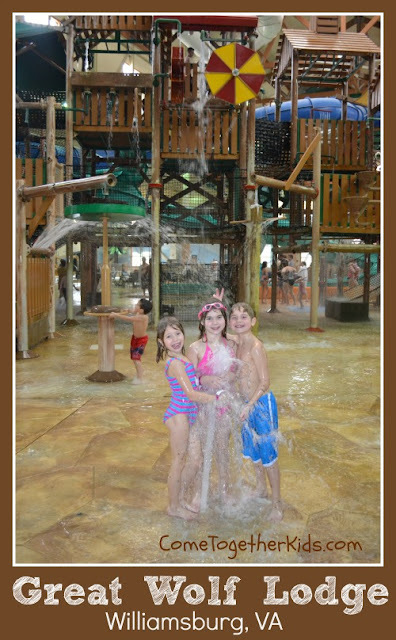 The main feature of the lodge is the large indoor waterpark and that's where we spent the majority of our time. The passes for the waterpark are included in your room costs and it's only available for use by guests staying at the hotel. (which helps to control the size of the crowds). However, guests are free to use the facilities starting at 1pm on the day they check in and the full rest of the day after their 11am checkout. 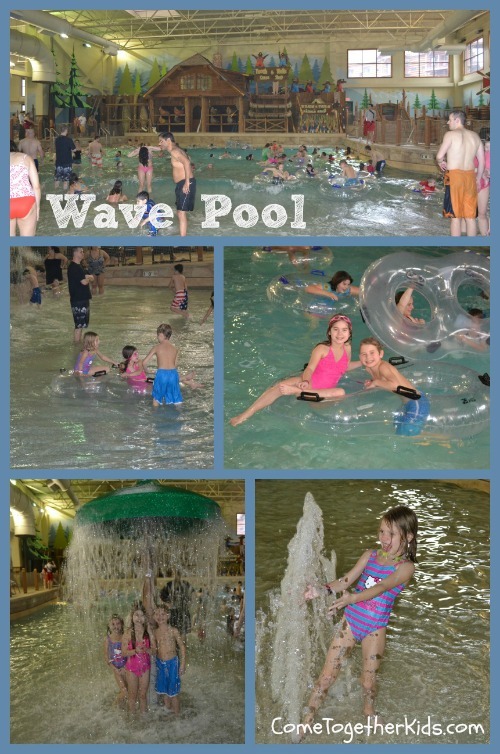 The large wave pool was also a big hit with my kids. They liked floating on a raft in the middle or being at the edge where the waves were breaking. It was nice to have that beach experience without any sharp shells poking your feet or sand getting in your suit! 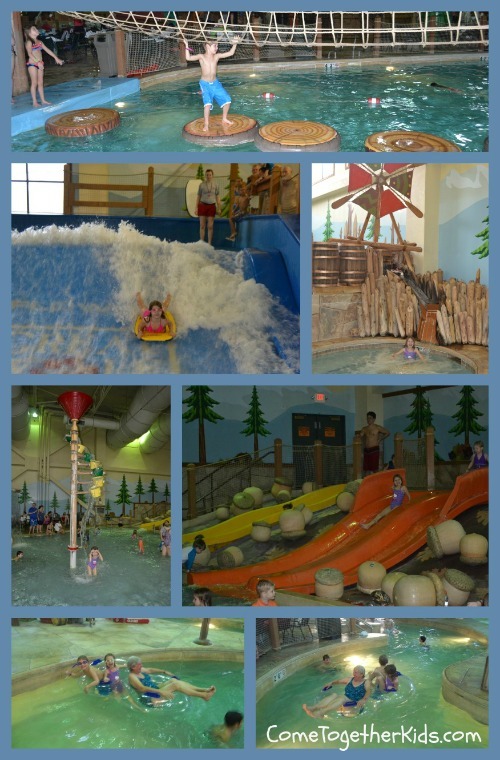 There were lots of other fun attractions too ~ floating logs to hop across, a surfing simulator, shallow kids' pool and slides, hot tubs (one for adults and another for kids), and a lazy river. There were also several large waterslides that I don't have pictures of, although I did ride them each several times! (You can see the resort photos of them HERE.) My son declared the Howling Tornado, with its big drop into a huge funnel, his "favorite ride ever, anywhere!" and I have to agree it was really cool. We also liked the River Canyon Run with its darkened tunnel and flashing lights and the Alberta Falls where you twist and turn down one of two large slides. Even the two smaller water slides off the central climbing area were lots of fun. While the cost for our whole little trip, even with a Groupon, was a few hundred dollars, it was definitely a fun and memorable trip for the kids and a really special treat. I couldn't afford to go back often, but we'd love to return again at some point. If you can arrange it, try to go on a weekday. We stayed Sunday into Monday and the crowds were manageable. The longest lines (approx. 20-30 minutes at times) were for the Howling Tornado, River Canyon Run, and Flow Rider surfing ride. Most of the other areas you could go right into. I've heard it can be much more crowded on weekends. Take advantage of the online check in. I didn't and had to wait in a really long line to check in on Sunday afternoon. I noticed that people who had done the online check in were able to go into a much, much shorter line. (info should be in the reservation email). Instead of a traditional room key, the plastic wristband you get at check in is somehow electronically coded to give you access to your room. (It's pretty cool, you just pass it in front of your door and it unlocks.) You can also set up your wristband to allow purchases to be charged to your room. It was really nice not to have to worry about keeping track of your wallet or room key while in the water. Plan for some of your meals to be outside the lodge. There are several eateries inside but you'll pay amusement park premium prices for your meals. We grabbed lunch before we checked in at one of the restaurants close to the lodge and ate dinner at another restaurant on our 2nd day when we left. Pack some snacks for your room. I packed breakfast foods and some snacks so I could keep costs down. You're not supposed to bring outside food into the waterpark area (there is a snack bar), but I did notice several families around us who brought in small snacks and drinks in their bags. Try to have someone get down to the waterpark right when it opens to claim a table. My son and I were at the doors right at 9am and were able to stake out a good table to serve as our "homebase" for the day. By 10am, nearly all the tables had been staked out. The lodge does provide free towels for use in the waterpark area. They were perfect for the kids, but a little small for an adult. You might one to bring a beach towel of your own if you want to be able to wrap it all the way around you. 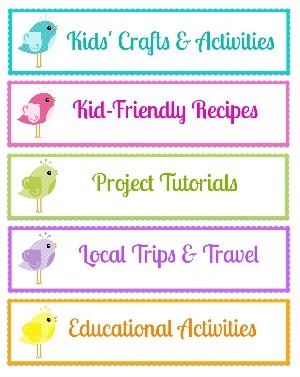 I thought there was plenty to do in the waterpark area for kids of all ages. Because that was the main reason we went, we didn't do many of the other activities in the lodge. However, I noticed lots of kids playing a Magic Quest game with a special wand (costs extra) and that could be a fun alternative to a whole day in the water, especially if you stay for more than one night. There was also an arcade, spa, art room, storytimes and activities in the lobby, and more. I can imagine it would get extremely pricy if you let your kids do all the extras, though. I found the place to be clean and well maintained and the staff we dealt with were usually quite friendly and helpful. (I often expect the worst after reading online reviews, but we had no problems.) However, I will admit that the pizza we got at the lodge for dinner was pretty gross, especially considering it cost close to $20. The lifeguards in the waterpark were very attentive and I felt comfortable letting my kids (ages 7, 9 and 10) buddy up and go on some waterslides or attractions without me right by their side. We stayed in the Loft Fireplace Suite and it was HUGE! It had two double beds, a separate seating area with a pull out couch, a small balcony, a fireplace and stairs leading up to a loft with another double bed and a half bath. Since we were planning on staying at the park after checkout at 11, I took most of our belongings out to the car. I rented a locker in the waterpark for $10 to hold our change of clothes, my purse and camera so I'd have quick access to them until we left the resort around 5pm. 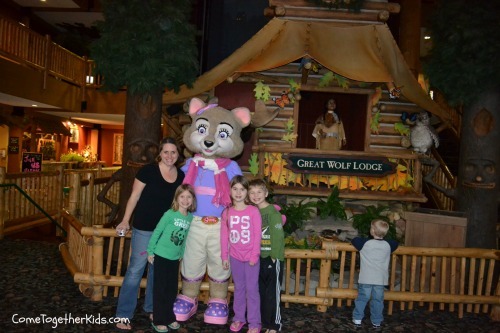 I hope you've found this post helpful if you're planning your own trip to a Great Wolf Lodge. Right down the street from us "literally". I'm glad you had a good time. When you come back and I hope you do, check out Pierce's BBQ for a lunch or even a BBQ dinner, quite good, Jungle Jim's I've noticed isn't open as much as they use to be but that is a fun place for a splurge. In town there are several places to go and pick up bagel at Manhattan Deli, NY Deli is a GREAT family place to go that has anything and everything that you would want for an entire family with diverse eating. Since we live here we never have stayed at GW Lodge but it was fun to read your review. I often recommend it to out of town guests but have no information to really offer them on staying there. Thanks! Thanks for the tips! We'll definitely be back. I know the kids would love to go to GWL again and I'd really like to see some of the other historical sites in Williamsburg. I did find this review helpful. Our family has been saving all our dimes with the hopes of one day making a trip to Great Wolf Lodge. We'd probably go to the Williamsburg location, too. Thanks for the tips! We have been twice a year, for several years until moving to China. We got to spend 3 nights there when we were back visiting last summer (we go to the GWL in the Wisconsin Dells). My sister and her kids joined, and we got a large suite with a kitchen and living room... so we had lots of room. It is nice becuase we can cook and eat there, rather than having to go to the expense of eating out for each meal. The GWL at the Dells is awesome! We all love going. We once had a chance to stay at the GWL in Niagara Falls (Canada), and though we had a good time, we had to admit it wasn't as great as the one in Wisconsin. It wasn't as large, and the waterpark portion was contained to one very large room, whereas the Dells is split into several rooms. With younger kids it made it hard to keep them all where you could keep a good watch over them... they all wanted to head in different directions. It is a perfect place for a family get away!!! My kids love Great Wolf Lodge. We've often spent a long weekend there in January and we always have a good time. In addition to the amazing waterpark, they have Paw Passes and Wolf Passes that will bundle several of the resort activities for a 25% discount. Sometimes we'd just get one pass and let our two girls share the activities like MagicQuest game and the arcade credits. The kids love the suites with the special kids' alcove. It's not as private as a 2 room suite, but it's a fun place for them to sleep and hang out during our downtime. And if you forget to pack anything, there's a huge Walmart just down the street. Thank you for your reviews of the Williamsburg GWL! It was helpful to read some positive input after reading some of the scathing reviews on some of the trip websites :0 So overall, would you say the rooms are very clean? I am a bit nervous about booking a room based on some of the comments about the rooms being run down and uncleanly. Thank you for humoring my pre-booking travel phobia (LOL)! We just had a terrible travel experience w/a hotel in NC so I am super sensitive. Hi Robin, yes I can say that our room was very clean. Obviously, we only stayed in one room out of the hundreds there, so I can't say positively that every other room was perfect, but everything I saw in the hotel looked fine as far as cleanliness and upkeep. ( I was nervous after reading all the reviews too). As I mentioned in the tips above, the one thing that was accurate in the reviews was that the food was pricy and not that good. My kids and I will eat just about anything and even we thought the pizza was pretty gross. However, there are several restaurants near the hotel and the rooms have little fridges and microwaves, so you do have options. Hope this helps! prices, and also monitoring associated details to have a full review of USPS media mail. UPS Tracking to track your media mail, ensure you have a monitoring number. 7 Deadly Sins can without a doubt be your financial plan New Year festivity. With DJ Harry presenting to you some exceptional remixes from Bollywood, Sufi, retro and house music throughout the night. Not just music, atomic beverages and smorgasbord will likewise be there for your pleasure. We have top android app developers. For the very best individual experience therefore regarding guarantee macysinsite.co you could go to "My Advantages" web page on Macy's Insite Website. The open tube well pool concept is one of the most unique water sources that you shall experience in any resort around delhi ncr. The rooftop provides an Ariel view of the vicinity and the next day tractor ride to the Ganges was a remembrance of the lifetime. Riding through the villages was an ultimate experience depicting the traditional village cultures. Well nice work was such a great an unique topic. This is a completely interesting to read this blog. 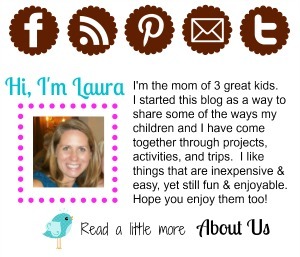 I would like to thank you for the efforts you had made for writing this amazing blog. Keep it up the extremely good writing. I am gonna bookmark this page, thanks for the information. I appropriate to your work please visit us Best Online Business Listing Website. I will be sure to come back here.
. I believe in the honesty of relationship, opinion and identity. The views and opinions expressed on this blog are purely my own. Any product claim, statistic, quote or other representation about a product or service should be verified with the manufacturer, provider or party in question. Wow! I want to take my kids there, too. Remember that the offer goes out 30 days after billing day Webnode Go and also obtain your totally free food currently. customer satisfaction survey Customer Satisfaction Survey as customer survey To begin the survey, go into the info from your McDonald's invoice enter survey to win Kroger Employees as well as their family participants. 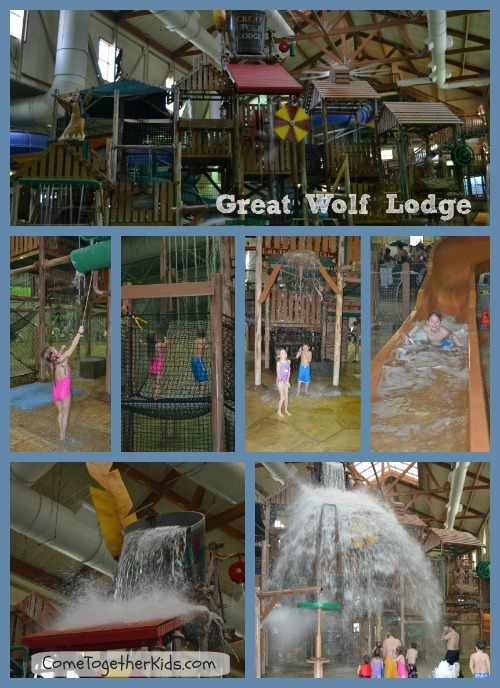 I am so happy to see this Great Wolf Lodge Review here and i am sure that children will really love this place. Zong Call Packages Daily, Weekly, Monthly, 2018-19.Zong offers affordable call packages to its customers. In this article, we will look at the Zong Call Packages Daily, Weekly, Monthly, 2018-19. Zong is the leading 3G/4G mobile internet provider in Pakistan and a growing telecom company. Let us look at Zong call packages in this article. Nice Post. I really appreatiate posts.